William Bond became the first Warrensburg settler, when he arrived in the Echo Lake area, in 1787. Shortly thereafter, Warrensburg became known as "the Bridge" because it was the location of the only bridge in the area that crossed the Schroon River. 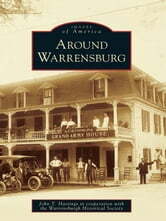 In February 1813, the town of Warrensburg was formed from part of Thurman. By the mid-1800s, A. C. Emerson and B. P. Burhans had moved to Warrensburg and begun to harness the waterpower of the Schroon River and utilize the nearby timber resource. The Emerson sawmill and Burhans's tannery and gristmill provided employment and capital to support a growing and thriving town. Other industries, such as a woolen mill and pants factory, sash and blind factory, shirt factory, and shoe peg factory, soon followed. With the dawn of the 20th century, improved transportation in the form of railroads and the automobile began bringing more people to Warren County. This trend continues today as numerous visitors summer in the Adirondacks to enjoy the clean air and water of the north country.